Our company holds expertise in manufacturing and exporting wide assortment of Corrosion Coupons that accurately determine the corrosion of metals in various service conditions. Corrosion coupons are produced in number of sizes, shapes, and material as per customer needs. These coupons meet NACE Standard requirements and tested before shipment. We supply these products in VCI Bags for excellent storage of ferrous and non- ferrous coupons. These bags generally protect material for up to 1 year under proper environment conditions. We always take care of proper cleaning procedures as given in ASTM-G1, NACE Standards. A proper record of initial weights, exposure dates, exposure time, and location for each sample is maintained. This information is also provided on VCI Bag. Each coupon is pre-weighted before the dispatch of the shipment.Our Technician and experts can provide technical assistance at the request of customers. Backed by the experience of over 25 years, Caltech Engineering Services have been able to establish as one of the prominent manufacturers and exporters of a comprehensive assortment of Industrial Instruments and Equipment. 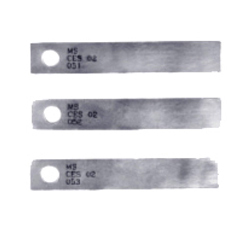 Our range of products comprises Surface Profile Gauge- Analogue, Bresle Test Kit, Chloride & Salt Test on Steel Surface, Chloride Test Kit Abrasive and Chloride Test Kit Surface among others. These products are very useful in the field of Cathodic Protection, Non Destructive Testing (NDT), Paint & Coating, Corrosion Testing and Welding Inspection instruments. We are also specialized in providing after sales support and technical expertise for our entire range of products. We always strive to provide an unmatched quality range of products to our clients. There is a team of qualified engineers, technicians and professional consultants to support our worldwide operations. Our entire range of products is manufactured as per NACE, ASTM, SSPC, ISO, SIS, IS, BS, DIN and global industry standards. Backed by a sound infrastructure, our equipment have proved their usefulness and utility for critical applications and testing specification. These features are responsible for the growing demand of our products among our valued clients that include the names like Oil & Natural Gas Corporation (ONGC), Engineers India Ltd (EIL), KNPC, NKK, PTTEP and TOTAL. Our range of instrument and equipment is suited for dedicated H2S laboratory. Specifically designed to provide advanced H2S testing capacities, these equipment facilitate efficient and safe handling of H2S. We also offer these products in various customized forms for testing in H2S environment. It is because of these factors, that we have earned a wide clientele across different parts of world such as North Europe, Middle East and South East Asia.